The state flag was introduced in 1919, and has not changed since. The state flag is derived from the national flag with a swallow-tail fly cut as (7+1+2+1+7):(7+1+2+1+9+12). Smith (1982) designated the use of this flag as -SW/-SW. Now, I know that currently Iceland has a treaty with USA regarding its defence, and that the US Navy performs as an IDF (and uses the US ensign), but possibly there are some kind of military units on land? In any case, this flag was certainly used as war flag and war ensign before the treaty was signed. Iceland has never had any military forces of its own, before or after the treaty with the USA. It does have an armed coast guard, but I believe this is considered a civilian force similar to the police. I therefore believe it is more correct to designate this flag as -S-/-S-. 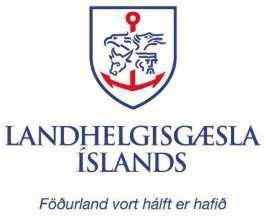 Islenska Lanhelgisgæslan (Icelandic Coast Guard's Division of Air Operations) was formed in 29 Dec. 1955. According to Cochrane and Elliott (1998), the State flag and ensign and the coat of arms are carried as markings. Examples can be seen at http://www.airliners.net/open.file/455660/L/ and http://www.airliners.net/open.file/233597/L/. Up till this year (1998) Iceland had six official flags, established by the flag law and a presidential proclamation, both of 1944. These were the national flag, the state flag (swallow-tailed), the president's flag, the customs flag, the flag of the post and telecommunications service, and the pilot flag. On 12 June 1998 Iceland's parliament adopted an act to amend the flag law of 17 June 1944. Two flags were abolished by the amendment: The flag of the post and telecommunications service (because of privatization) and the pilot flag (this had gone out of use). This means that Iceland now has four official flags: The national flag, the swallow-tailed state flag, the president's flag, and the customs flag. The presidential flag and the customs flag are both based on the swallow-tailed state flag. In the president's flag the national arms of Iceland are set on a white panel in the centre of the cross. The customs flag has a silver T in the canton. The presidential flag was adopted 18 July 1944. The flag is swallow-tailed. The state flag defaced with a square white panel in the middle of the cross (apparently the size of square panel is 8 units [one unit being 1/18 of hoist]), with the national coat of arms. The Customs Ensign is like the State Flag, with a white (silver) sans-serif letter T (T stands for "Toll"?). Album des Pavillons shows a sans-serif letter T (also in correction 1), but other sources show it in a serif-style (Times New Roman?) letter. Maybe the details of the letter are not defined. I believe the relevant legal documents only speak of a T. In former times the T seems to have been serif-style, but the modern version is not. According to an official flag book Hermansson (1991) the letter is coloured silver grey. On the web page of the Prime Minister it is noted that the height of the letter T is half the width of the canton. It is also said that the T is coloured silver. The version without a crown and with a serif-style letter T was in use from 1944 to about 1980. This flag and ensign was also established by the Royal Resolution No. 1 on the Law on the swallow-tailed flag and its use, dated 12. February 1919. Again, the badge, capital T, is specified as silver and the crown as golden. And again: The blue colour must be ultramarine. When Iceland became a Republic in 1944, the crown was dropped from the customs flag and ensign and the badge consisted of the silver capital T only (flag act of 17 July 1944). This crowned flag is shown in Flaggenbuch (1939) as used before Iceland was a republic. Two other similarly defaced flags are shown in Flaggenbuch (Post and Telegraph Ensigns), but apparently not used today. I guess the service was privatized at one time or something like that. Were there ever uncrowned versions of the two ensigns? Originally, there were separate ensigns for the Post and the Telegraph, both with crowned emblems. These were combined into a common flag, again with crowned emblem, a couple of years before World War 2. And you are right, the modern PTT flag was discontinued because the PTT was privatized. White-bordered national flag. Width of the border is gives as 4 units (unit being 1/18 of national flag hoist) therefore making the total ratio 26:33.
recapitulative edition of the Album shows it, though. None of late pre-1990 corrections mention anything about Iceland. The pilot flag was introduced by the very same legislation that established the post and telegraph flag in 1919. It is described this way in the Royal Resolution: "The pilot flag shall be like the merchant flag but with a white border all around that is as wide as the cross, that is 4/7 of the breadth of the blue panels." Though the pilot flag was long out of use, it was only formally taken out of the flag act in 1998 when parliament revised Iceland's flag legislation (see comment). I am not sure exactly when the pilot flag was replaced by the internationally recognized signal flag used in other countries, so I can't say for sure if it survived long enough to have existed in both sky blue and darker blue versions. The new symbol of the coast guard was adopted on 1 September 2001. The flag appears to reflect a lack of a sense of history, but the old symbol under which we fought the cod wars with the British was in blue with a white anchor, our national colors. The state ensign defaced with a silver post horn crowned with a golden crown. The details of the horn are not clearly visible, so I leave it like this. The post flag and ensign was established by Royal Resolution No. 1 on the Law on the swallow-tailed flag and its use, dated 12 February 1919. The badge is specified as silver and the crown as golden (Source: Lagasafn. Gildandi lög íslenzk 1931, Reykjavík: Bókadeild Menningarsjó�s, 1932, p. 16). Note that the blue colour must be ultramarine. The flag was used until a 1938 Royal Resolution decided on a common post and telegraph flag, presumably also with a Royal crown. This flag was in turn formally abolished when Iceland became a republic in 1944 (flag act of 17 July 1944). State ensign defaced with silver five-pointed star from which are emerging eight thunderbolts crowned with golden crown. flag. Unfortunately, I have do not have a copy of this document and I am not sure exactly what the combined emblem looked like. Again, the combined post and telegraph flag with the royal crown as part of the badge was abolished when Iceland became a republic in 1944 (flag act of 17 July 1944). The final version of the post and telegraph flag before its elimination is based on the drawing found in Hermansson (1991). Though the source is an official one, I am a bit skeptical about the emblem in the illustration of this particular flag. It is outlined in a very thin silver line which would make the emblem near to invisible in an actual flag. We might deduce what the emblem looked like from the known designs of the post and telegraph flags before and after the crown was removed. Then we arrive at something like the above image. Note that this is nothing more than a hypothetical reconstruction. One point of uncertainty is the number of bolts of lightning: The 1919 version had eight bolts whereas there are only 6 in some illustrations of the 1944 flag (including the most modern version abolished in 1998).